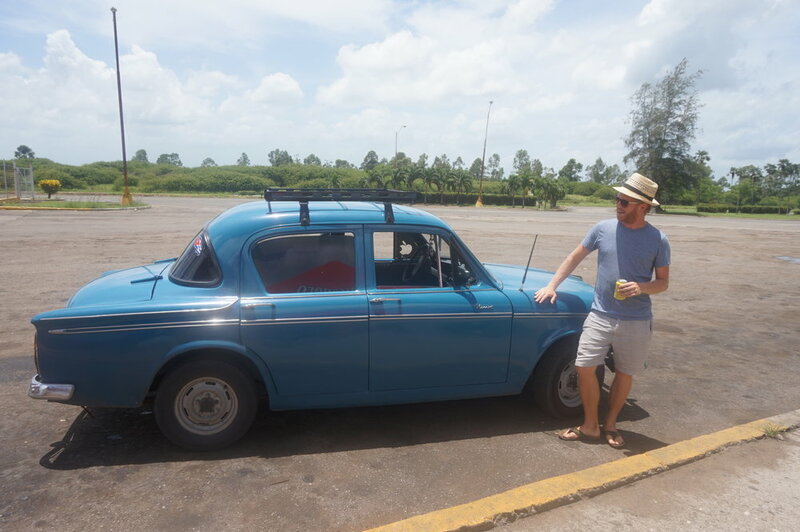 Travelling Cuba on a budget is not as easy as we first thought. Cuba is fast becoming the place to be but with a dangerous mix of a package holidays and a lack of independent tourists, backpacking in Cuba can be expensive. Having spent almost a month in Cuba I have broken down some costs and collected some tips for travelling Cuba independently, without breaking the bank! Firstly you will need to know that Cuba has 2 currencies. The locals use CUP and it is roughly 25CUP to 1CUC. Most prices in tourist areas are in CUC which is around 1USD. You can read more here. The main form of accommodation in Cuba is ‘casa particulares’. Basically local people apply for a licence and rent out a spare room or apartment to tourists. The basic standard is a double bed (often a single as well) and an ensuite bathroom. You pay per room so travelling as a group of 3 is the most economical. While many casas can be booked online, only the more upmarket ones will have this option as internet in Cuba is difficult to come by. There are more than enough casas (denoted by the blue symbol on the door) to just turn up in a town and knock on some doors to find a nice one. The important thing to realise is that the casa owners pay a fee to host guests so they hardly make any profit from your first night’s stay. If you are staying more than one night though the prices can be heavily discounted. Most places quoted us 25CUC per night regardless of the location or standard. For stays of 3 nights or more we never paid more than 15CUC per night except in Havana where 20CUC was about the cheapest we could find. Don’t forget, everything at the casa is negotiable! This goes for meals, laundry, any bookings they make for you as well as the actual accommodation. So if your travelling cuba on a budget be a bit savvy and save a few bucks a night. 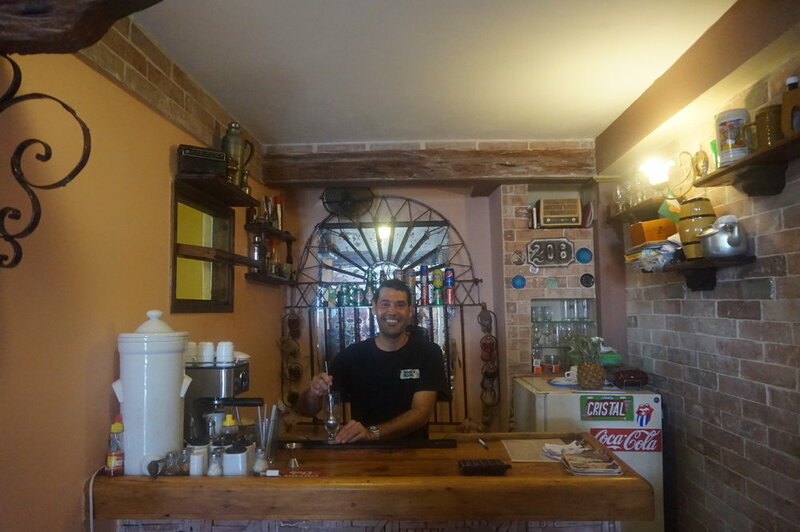 Most restaurants in Cuba are aimed at tourists so the price is in CUC . Meals in an average restaurant will cost you 5-10CUC (roughly equivalent to the USD). Taking a wander down some of the side streets or visiting less touristy towns will give you a taste of local Cuban food at the price locals pay. Here food can be bought for around 50c for basic pasta or meat dishes. Every casa will offer you breakfast and dinner. We found these to be hit and miss. Breakfast was usually eggs, bread, coffee and fruit for about 3-5CUC per person. We found it much cheaper to buy some fresh fruit from a market and have that for breakfast. Dinners were around 7-10CUC per person and included a choice of meat, rice, salad, bread and sometimes a dessert or starter. These meals were more expensive than eating in local restaurants but were always good, fresh food. 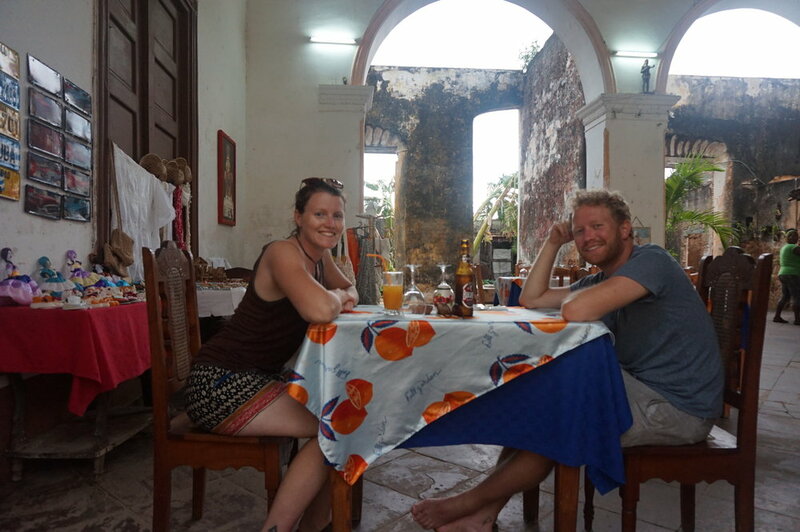 We usually ate at our casas once during our stays of 3-5 nights and ordered things like lobster as a treat! Most casas will include use of kitchen facilities so make use of these to prepare food. Although, you will be hard pressed to find anything more exciting than pasta in the sporadic supermarkets in Cuba. A huge money saving tip for cuba is buying a filtered water bottle or a steripen to purify the tap water. Water in Cuba is about 70c for a 1.5L bottle in the supermarket but up to 2CUC in a small shop or restaurant. In the heat you will need at least a bottle a day per person so it adds up! Plus think of all the plastic bottles you could save. Most independent travellers will use the Viazul bus company which covers most of the country and has reliable, comfortable and affordable air-conditioned buses. So why wouldn’t you use them?! Well, reason number one is their popularity. These buses often book up a few days in advance and unless you have very set plans it can be annoying to have to book your next bus the minute you arrive in a town. Reason number 2 is location. The bus terminals are often located outside of the town centre which results in a long walk or a taxi ride added onto the price of the ticket. Often more than once if you need to go and book a ticket one day and then return for the actual bus trip 2 days later. I recommend using a collectivo taxi service which pools together a car load of tourists, collects you from your casa and drops you wherever you ask at the other end. The price is usually similar to the bus. You’ll find people offering collectivos in all the main squares and near the bus stations. If can’t find someone just ask your casa owners. Again, all prices are negotiable especially if you are a group. The other option if you're in Cuba on a budget is taking the local buses. Here it is necessary to have at least basic Spanish as they will be reluctant to sell you tickets. What we experienced was the ticket seller offering us a (negotiable) price which was much cheaper than the Viazul but still more than what the locals were paying. She then pocketed the money herself. The local buses had no air-con and no passenger limit but if you can get a seat the windows provide enough ventilation. Not recommended for journeys longer than 2-3 hours. Backpacking Cuba can be difficult and tiring to navigate but once you get into the swing of it and relax there are some amazing things to see and do on this beautiful island. Read our article on the Top 5 Spots in Cuba for inspiration.